As you may remember from last week, Kim Richards organized a trip to Ojai for all the ladies for a weekend of healing, relaxing, and growing closer together. It went about as well as you can imagine it would. 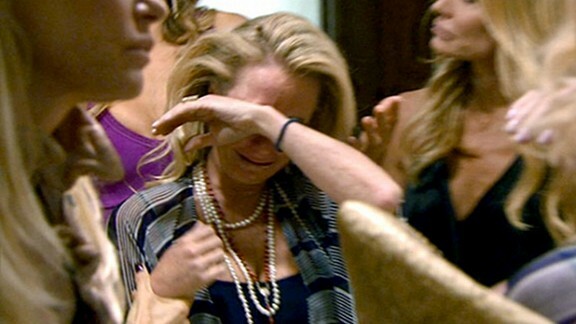 When we last saw our housewives, Kim was crying, Adrienne was telling everyone that Kim was crying, and Brandi was telling Adrienne to stop telling everyone that Kim was crying. There were also some other paying customers in the restaurant who would look over every once in a while, horrified. (To be honest, that’s probably the actual saddest thing that happened last night — some nice family’s expensive resort vacation was disrupted by a Bravo shoot.) But after sitting around desperately trying to start a real, explosive, “Dinner Party From Hell”–grade brawl like rubbing together so much rosé-soaked kindling, things sort of fizzled out. (The fight was too scattered to have any chance of survival; one minute Kyle and Adrienne are straining to get inconsolably upset over Brandi’s use of the F-word, the next minute a third-tier argument from last season’s reunion show is being dredged up again. Focus, ladies.) By the next morning, everything seemed basically cool. It was as if nothing ever happened. Actually, it was exactly as if nothing had ever happened. Hey, producers? How come every time we went back to Kim for a talking head, hoping to get some perspective on last night’s episode, we were just given one of the same four sound bites about everyone healing and getting along that we’d been seeing since she first arrived at the resort, like a 404 error message that keeps popping up no matter how many times you retype the URL? I needed some kind of temporary closure; I needed to talk this one out with my girl, and I never got to. One thing is for sure: Kim was feeling great once they got to the spa that afternoon. Here are some things Kim said at the spa, sans commentary, because I’m not here to judge. Addiction is just a “degree of wacky” now, apparently. And hey, who isn’t some degree of wacky or another, am I right?